A hypothesis to explain some of the features of LHON ..
some real clues to the understanding of the enigmatic features of LHON. with one pump labelled PP, for Proximal Pump, and the other labelled DP, for Distal Pump. The PP contains the the mitochondrial peptides MT-ND1, MT-ND2, MT-ND3, MT-ND4L and MT-ND6, with a number of subunits. 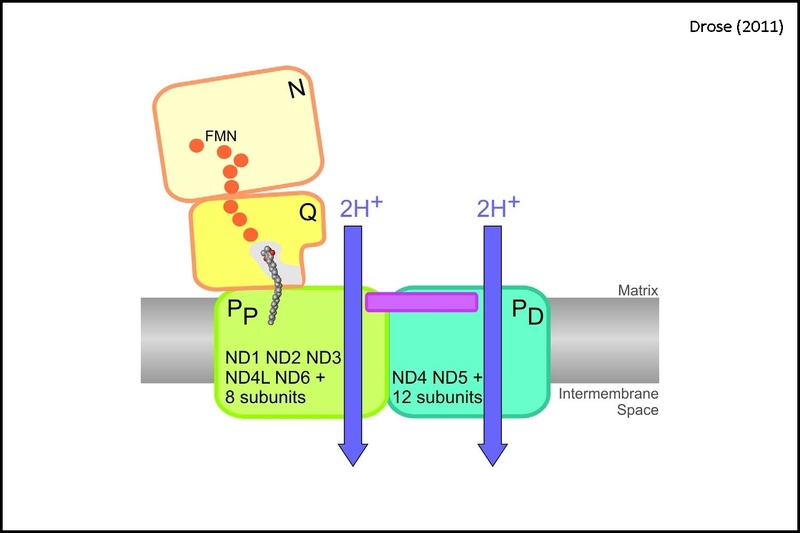 whilst the DP contains the mitochondrial peptides MT-ND4 and MT-ND5, again with some subunits. 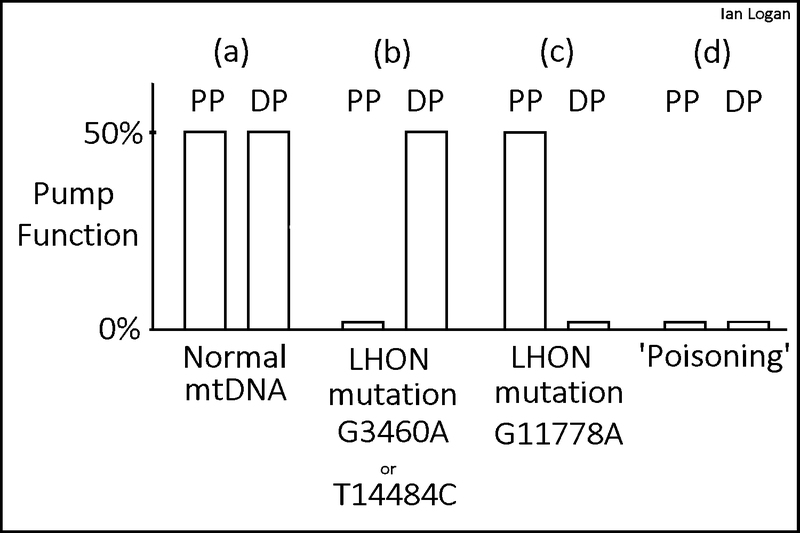 So, in a person with a LHON mutation, G3460A & T14484C will be found in the PP and G11778A in the DP. BUT ... can this description of COMPLEX I having 2 proton pumps be used to explain some of the features of LHON ? might be altered by the presence of a LHON mutation. Finally .. in case (d) - in the presence of a 'poison', perhaps Methanol, or Rotenone, there is very little, if any, function. might be much higher that the amount actually needed by cells most of the time. Perhaps 'normal' cells with  their 2 pumps working might be able to manufacture twice as much Complex I as ever needed. and in this situation, if 'supply' is exceeded by the 'need' for Complex I LHON disease may occur. 'DEMAND' and this leads to mitochondrial fission, growth and the assembly of more Complex I units. and each question is followed by an answer given using the above hypothesis. 1. Is LHON caused by mtDNA mutations, such as G3460A, G11778A & T14484C ? -   Yes, LHON mutations, and mutations in the other subunits, do cause the condition. 2. Is there is a demonstrable 'fault' associated with the mtDNA mutations ? -   Yes, a LHON mutation reduces the effectiveness of the enzyme Complex I by 50%. 3. Why does LHON have varying 'penetration', that is some people get symptoms whilst other do not ? can provide 50% of proton pump function; and this may well prove sufficient throughout life. 4. Why do the symptoms and signs of the condition appear suddenly ? the system is fragile and unable to handle stress, and at such a time there would be sudden failure. is deterioration to be expected ? and this level is perfectly good for life, but not for the proper functioning of the optic nerves. 6. Why do males show more signs of the condition than females ? .. the double-X in a female makes for greater stability in complex I. .. and possibly males are more exposed to toxins, both voluntarily and involuntarily. So, overall, it appears that the '2 proton pump system' does explain many of the features of LHON.